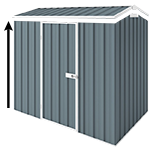 The Regent range of our garden sheds is manufactured from low maintenance ribbed steel sheeting and is designed to add value to your home. The doors are in the gable end and the roof has a slight overhang to add to the overall appearance. Doors are hinged for added security and durability. To secure the walls to your concrete slab you will need 12 anchors for this shed. The shed is easy to assemble, even for the non-tradie type! I thought I was missing two pieces but after having received replacements (straight away, with no suggestion I might be mistaken) I found them (where the concreting company had put them!). My fault entirely! The service from Cheap Sheds is also very good, with emails being answered immediately (so unusual these days!) and queries (about the 'missing' pieces) dealt with efficiently and clearly.